Home » Belize Travel Blog » Art & Culture » Christmas Is Coming: Have I Got the Most Beautiful Ambergris Caye Gift for You! 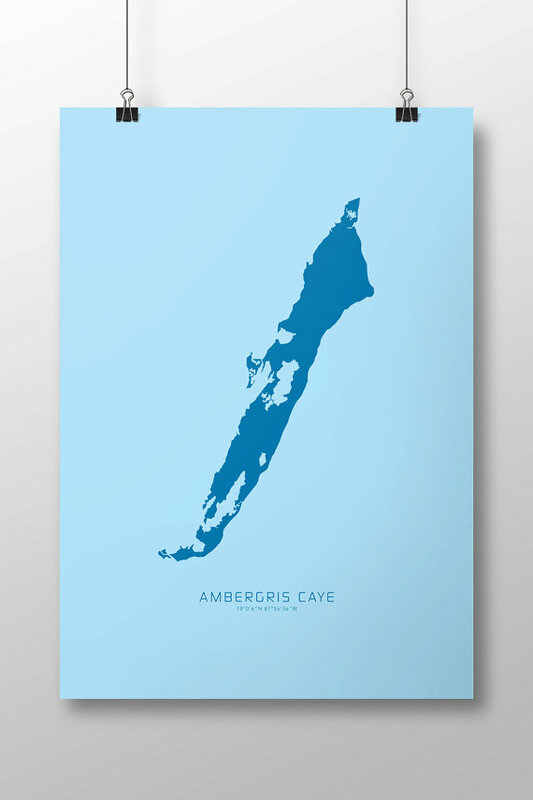 Christmas Is Coming: Have I Got the Most Beautiful Ambergris Caye Gift for You! I may have turned you off with the title. 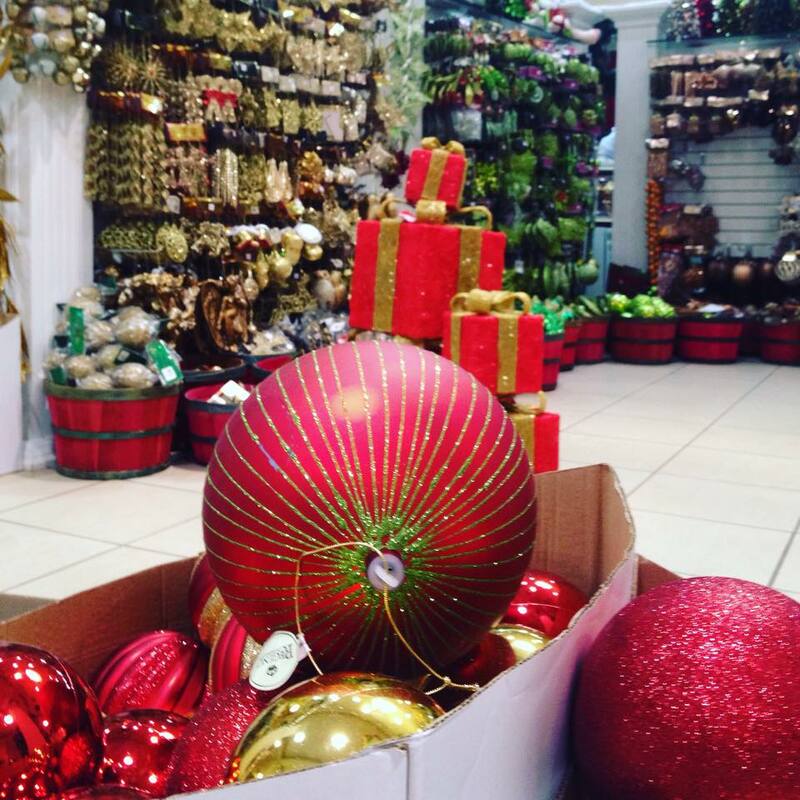 Christmas seems one zillion miles away, but I assure you, it is coming. And the display at the Macy’s of Belize, Mirab’s in Belize City, can prove it. Look at this photo taken last week. By the time it is all set up…it is QUITE the display. The idea all started before our trip to Beaver Island, Michigan this August. BEAUTIFUL Beaver Island for a 50th anniversary party – 1900 miles almost directly north of Ambergris Caye, Belize. We found a very VERY cool print of the island on Etsy.com as a gift. Artist: Bill Specht. And his shop is called Departure Islands. He’s from Brooklyn, NY. 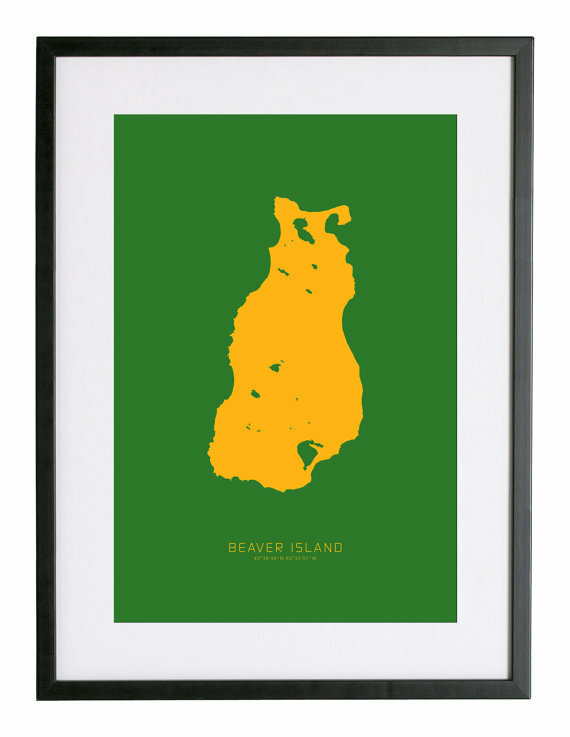 Here is his print of Beaver Island. It arrived in MIchigan packaged and absolutely beautiful in its simplicity. The place and it’s coordinates. I LOVE IT! And a very cool story behind it. “It All Started as a Boring Wall”: I live with my wife and 2 kids in a converted warehouse in Brooklyn. We had this large bland area of our apartment that needed some love – big gray wall, large black and white photo, gray couch below – Blah. We searched online for things that would brighten the area up but nothing really popped. I decided to create the artwork myself and made a series of islands that we have visited together – our honeymoon to Santorini, summer trips to Block Island, one last pre-child trip to Grand Cayman, and a few others. After receiving some encouraging words from friends and family, I decided to expand my library of islands and open up shop on Etsy. There are now 54 islands – places we have been and many more places we would love to go. I asked him a few questions. 1. Can you send me a photo of that wall? And look at this. Sigh…so beautiful. St. Barts and Kiawah in Florida. So we asked…can you make us one for Ambergris Caye, Belize? And…with a bit of discussion….here it is! And available at the shop. LOVE! So…there you go. The artist is absolutely lovely and fairly new to the Etsy game. He opened his store on May 2015. I have no part of all…other than admiration. The Ireland one is particularly stunning. Just thought you might like to see it. Here is Bill’s store on Etsy. 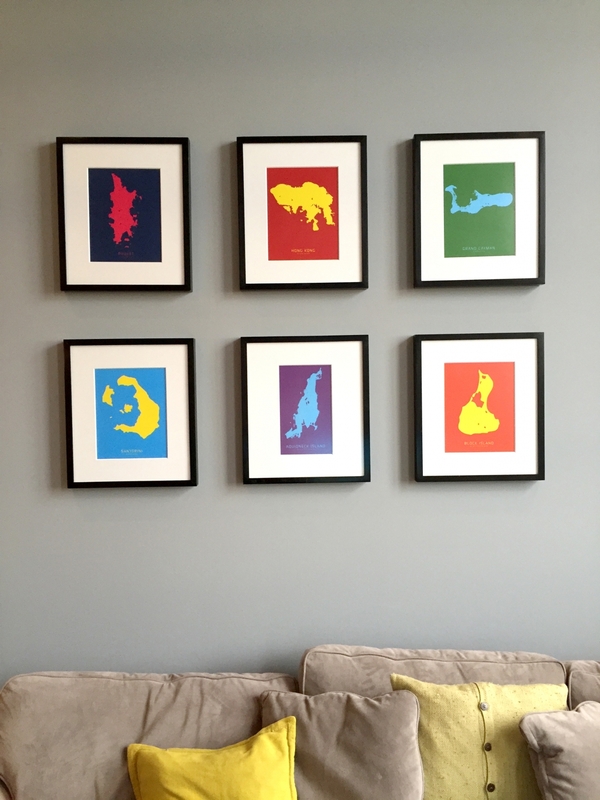 It really makes me want to visit more islands so that I too can have a beautiful wall of six. What a Beautiful Start to December in Belize! Ok, shoot me, but honestly I’m disappointed with the color…so blah for such a vibrant island. Sorry JMO. I agree. Turquoise, the color of our sea and orange or lime green would make me want to order one. Perhaps the artist can work with you. He’s a super nice guy! I love it. What a neat idea! 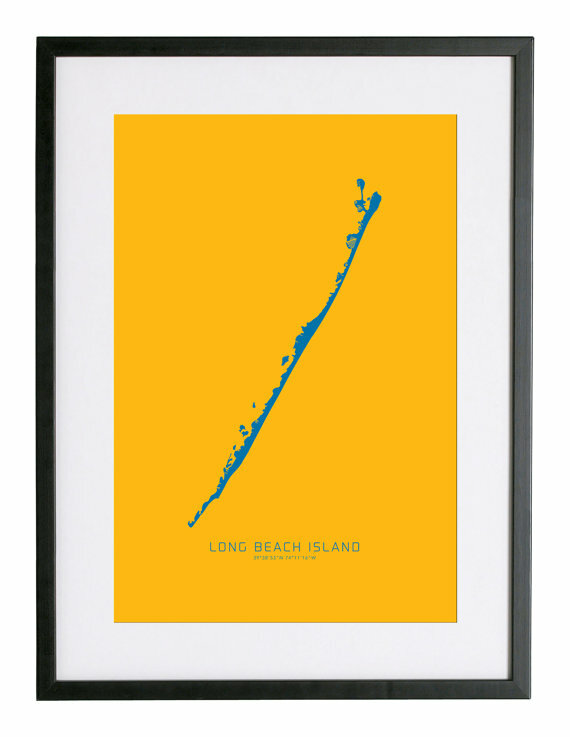 And you’re right, the perfect Christmas gift for any island lover (not just AC). There is an interesting balance between aesthetics and memory at play here. Pictures of the islands on which you have spent time take on a meaning richer and deeper than the Rorschach-like aesthetics. A colorful splat on a colorful page becomes a doorway to our past. My travels have been modest but I have been on 12 of the islands in Bill’s catalog. I am drawn to these, of course, and fill the flat surfaces with the warm contours of memories — getting married on St. Lucia, living on Aquidneck and Ambergris, bicycling through Long Island to Montauk and hiking around bluffs and back roads of Block Island, Shelter Island and Martha’s Vinyard, camping with family on Chincoteague and with my own kids on Catalina, visiting Sanibel’s beaches with my aging parents, vacationing and working in Hawaii. And Manhattan — too many to mention. Oh, where is Cape Cod in this catalog, Bill? I realize that all my life I have been drawn to islands of all shapes, sizes and geography. Thanks, Rebecca, you’ve given me a Christmas present already. That’s what I meant to say! 😉 I love this comment. Thank you Bob. Beautiful. There is something about islands….that is for sure. And capes too. They would look gorgeous side by side. I must get to this Block Island! Being from NJ…I…am ashamed to say I’ve never been to Block or Nantucket or Martha’s Vineyard or even Staten Island. (well not ashamed about the last one…) Sigh….I do REALLY love an island.